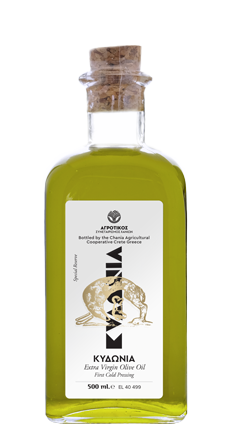 The most important product of the Agricultural Cooperative of Chania is the well-known Protected Designation of Origin (PDO) Kolymvari Extra Virgin Olive Oil. It is a nutritional “liquid gold” that is famous throughout the world as a protector of health, protecting us not only from cardiovascular diseases, but from numerous other diseases also. Natural juice of fresh and healthy olives with unparalleled flavor and distinct aroma. Kydonia was an important ancient city-state of Crete, on the ruins of which, the modern city of Chania was built. KYDONIA Extra Virgin Olive Oil, is extracted from healthy and fresh olives, mainly of the Coronean kind. The pristine production process, together with the ideal conditions of storage and packaging, result in the premium quality of the product. 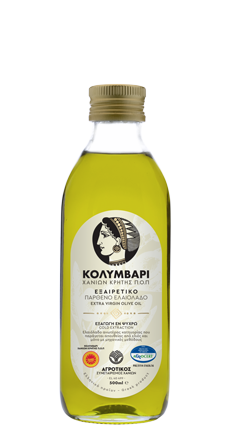 The olive oil produced by the Agricultural Cooperative of Chania originates mainly from olives of the Koroneiki variety. The cultivation of olives and the production of olive oil in Crete has a tradition of numerous centuries. There is abundant historical evidence that the production of olive oil on the island flourished from as early as 2000 BC, at the heyday of the Minoan Civilization, and was one of the main food products that were exported to the “whole world” of the time through sea trade, bringing great wealth to the inhabitants of the island. Apart from the unique tradition of Crete in the production of olive oil of exceptional quality, the soil and climatic conditions on the island, especially in the northeastern part of the prefecture of Chania, where the olive groves of our cooperative’s olive producers are located, are ideal for the cultivation of the olive tree intended for the production of olive oil. 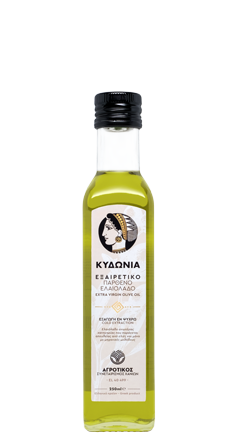 All these have made Kolymvari olive oil famous not only in Greece, but also internationally, and nowadays it can be found in literally all over the world. Each year, the roughly 4,000 olive producers of our cooperative, carefully harvest the fruits of the olive trees, which, with care, patience and persistence, have grown all year long, and bring them for processing the same day in our modern olive oil production facilities. 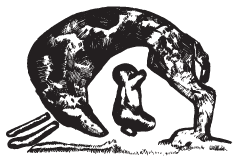 The production of our select olive oil is made using purely mechanical methods, under exclusively cold-pressing conditions, and without the use of any kind of chemical treatment, in order for the final product to be of the highest quality in the world, with exceptionally low acidity of 0-0,8 and unique nutritional properties. 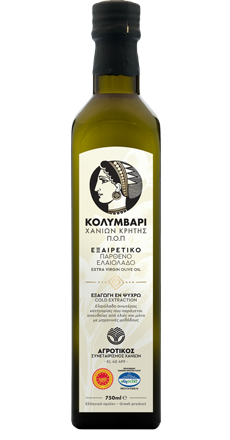 Olive oil – and especially extra virgin olive oil – is probably the best food in the world to provide us with the so-called “good” fatty acids, which is fat that promotes health and contributes to our better defense against diseases. The reason for this is that olive oil is full of monounsaturated fat, which is the best type of “good” fatty acids. Perhaps the most significant positive effect of the consumption of extra virgin olive oil to our health is the reduction of cholesterol and of the risk of atherosclerosis in general. 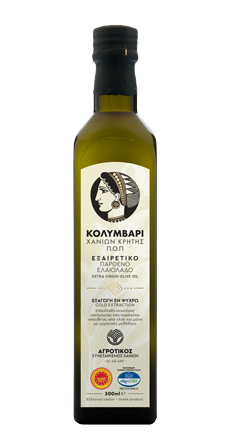 It is no surprise that international research has shown over and over again that Cretans, due to the regular consumption of extra virgin olive oil, have proportionally very low rates of heart disease. As the saying goes, “the healthiest hearts beat on Crete“. Apart from the promotion of heart health, extra virgin olive oil also helps prevent the hard to cure, omnipresent disease of our times, cancer, as it has been shown to have strong anticancer properties. This is mainly due to the fact that olive oil has a high anti-inflammatory effect, which prevents the onset of cancer, especially certain types of cancer, such as breast cancer. 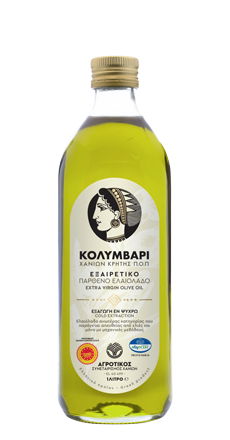 Also, extra virgin olive oil is full of antioxidants, and contains a large amount of Vitamin E, both of which also play a big role in preventing cancer. But the benefits of olive oil for our health do not stop here: As medical research has shown, frequent consumption of extra virgin olive oil has beneficial effects on bone development, on the proper functioning of both our digestive and central nervous systems, and that it protects our body from diseases such as high blood pressure, diabetes, osteoporosis, and even rheumatoid arthritis. Having all the above unique properties, that act as a shield protecting our health against small and large diseases and illnesses, we can easily classify extra virgin olive oil as a “superfood”, and in fact, as one of the best superfoods in the world!